In my working life as a civil servant, I used to do the daily commute from the suburbs to the London city centre. It involved standing on crowded platforms at something like 8 am often in freezing or wet conditions waiting for a crowded commuter train to come in that hadn't been cancelled by snow on the line, leaves on the line, extreme heat on the line or even a body on the line. When the train came in, there'd be a mad scramble for the doors which (no matter how hard you tried to calculate it scientifically) never stopped in front of the spot you were standing. Once on the train, there was a choice - to find an unoccupied seat (which at that time of the morning was a miracle) or to stand up in the small lobbies pressed against other commuters, usually with my nose under someone's armpit. People read newspapers - usually large ones which they had difficulty opening when squashed against someone else and often you would get someone's elbow in your face, as they tried to attempt it. Some read books which were less of a hazard of invading someone's space. Some even looked out of windows or slept. You generally knew who your fellow commuters were as you saw them every day and began to notice if they were not there. Those were the days when computer technology was still in its infancy and probably to a large extent still in the womb. Mobile phones were the size of bricks and were used purely to phone somebody. Computers were things that were the size and weight of a small fridge and were shared by a whole corridor of offices. When we finally progressed to one computer per room it was like a brave new world. We didn't even dream of one computer per desk in those days. Even so there was no internet, so the computers were there to crunch out numbers or data or to use as word-processors. A printer was not even in the same room, so often you would send a message to print something and hope, fingers crossed, that when you had hiked halfway across the building and down into the basement, you had something to collect at the end of it. Having now spent a good few years out of the commuter environment, I have had reason recently (because of hospital appointments) to catch the train a few times into the heart of London in the rush-hour. Oh my word, what a difference. Of course the delays and cancellations don't change; nor the excuses of this or that on the line; nor the mad scramble for the door when the train pulls in. But what has changed are the commuters. It is like entering a strange planet where people stare zombie-like into screens. On a recent trip I observed that EVERYONE in the carriage had an oblong device in their hand - some about 5 x 3 inches or some about 8 x 6 inches into which they stared. They used their fingers to brush off invisible crumbs on it in a sort of swiping action or to press buttons which would show up dancing candy or photographs. Some even watched moving pictures which looked suspiciously like Eastenders or Game of Thrones. Some appeared to have bits of string coming out of their ears and these were connected to the screens. As we pulled into stations, there were more people standing around on the platforms doing the same, staring into their hand-held screens. All had heads bent down, staring towards their laps. Nobody, but nobody (except me, of course) stared out of the window and watched real life pass by. I wondered if I were to ask any one of them to tell me what colour the sky was that day or describe the houses they had just passed, whether any one of them could answer correctly. 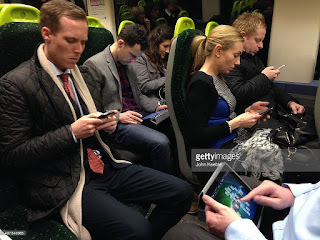 Do they spend their whole life staring at screens? Will they die being totally unaware of real life around them? Do they not notice the seasons changing or streets being demolished and rebuilt? I honestly felt I was surrounded by zombies. Out on the street, as I pondered this modern phenomenon, a woman walked towards me, head buried in her screen, string coming out of her ears, and, if I had not been the one to move, we would have collided. Brave new world indeed. Just wanted to share the following comment written by a young doctor on facebook. You've got a job that cost you £60,000 and 6 years of your life to train for. You're on a wage which, including all the extra hours you work for free, is barely minimum wage. Your daily work consists of trying to keep people alive and caring for people and their families that you can't do that for. Your boss comes in and says he wants you to work longer hours, more on evenings and weekends. And he wants to cut your pay by 30% and nobody else will employ you to do your job because nobody else can. He tells you that you don't work hard enough. He shows you a graph he says shows evidence that people are dying more at the weekend but he's holding it upside down and clearly has no idea how to interpret it. He tells you to sign the new contract or leave. He tells all your friends that your lying about how hard you work, how much money you will earn and how much "better" your contract will be. You don't want to leave and he knows you don't want to leave so he thinks he can do what he wants. But ultimately you will leave and so will everyone else who works at the job because it's not a safe or humane job any more, allowing him to dissolve the company and sell it off to the highest bidder. He's even written a book detailing his entire master plan. Don't let him kill the NHS. Following on from my last post, I saw the lung consultant last week. He decided I needed a further three tests before everything can be wrapped up. So last Thursday I had a PET scan where they inject a radioactive tracer into you and scan you. The worst bits were the (by now usual) nil by mouth for 6 hours, having to lie completely still without moving a hair and keeping my arms above my head for 20 minutes while they scanned me. I never realised how long 20 minutes can be. Thank goodness I didn't get an itch or want to sneeze. On Thursday this week I am having a bronchoscopy with ultrasound. The medical term is EBUS. Sounds like you are going on an electronic magical mystery tour, doesn't it? In reality it means EndoBronchial UltraSound - in other words they shove a camera and an ultrasound probe down into your lungs. O joy! After two gastroscopies and a colonoscopy since December, I'm getting a dab hand at this. Hopefully once that is all wrapped up, I shall know a bit more what has also shown up on my lungs and when I am having the stomach operation to remove the tumour. Unless, of course, in the meantime another bit of me shows up in these tests needing urgent attention. The good news is that there is very little of my inner anatomy that has not been explored these last few weeks (apart from limbs and brain), so I'm getting the best of medicals imaginable.